In honor of the release of the Megadeth album, Risk, Capitol Records, Megadeth and the Megadeth, Arizona Ministry of Tourism thank you in advance for your visit to the pioneering website that became the first and finest rest stop on every internet roadtrip. More interactive than before and as rich in Megalore as ever, the biggest little city on the internet is proud to welcome first-time visitors and returnees for even more great games and gossip, romances and rumors, stories and queries, mail, memories and music! If you are putting a link to Megadeth, Arizona or are a press person that needs graphics for your feature click here! Visit the Digital Drive-In, to view our low and high bandwidth video clips! Tune into new and previously unreleased Megadeth tracks on K-Deth 101. 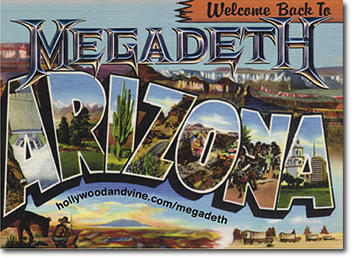 Visit Vic's Cactus Hut, Megadeth, Arizona's Official Gift Emporium. Share a tale or two with other Megadethers at the Resurrection Connection. New Tour Dates! Megadeth will be joining Motley Crue on the Maximum Rock 2000 Tour! Buy tickets online before everyone else. Download your own Megadeth HOTBAR. Visit megadethdirect.com for all your Megadeth gear! Enter to win tickets to see Megadeth on the Maximum Rock tour. Find out more about RISK, the latest album! Guitar.com presents: Exclusive footage of the making of "Crush 'em," featuring Jean-Claude Van Damme and Bill Goldberg. Check out the Bio, Press Release. To receive email updates on Megadeth click here! See some photos of the RISK recording session here! Visit some Megadeth fan sites!